To support you through the ups and downs of Middle School, we have a counselor who is available to talk to you. You will get to know our counselor during a required 6th grade elective that helps you adjust to Middle School. You can contact Toneka Webb, Middle School Counselor, or visit her in her office behind the Middle School office building. Our dining service run by Epicurean Group uses fresh ingredients and offers three healthy meals a day for boarding students during the week. Day students can sign up for breakfast, lunch, or dinner ahead of time. We cook cuisines from around the world, ranging from Asian and Italian to Mexican and American. Athenian's chefs are especially sensitive to the dietary and health needs of a diverse boarding population; they are eager to get to know you and have remarkable memories for your food preferences and allergies. Day students, boarding students, faculty and staff, and residential families eat meals together. Athenian's learning services embraces students' strengths and skill levels and is here to help every student at Athenian succeed. Our goal is to help students become strong self-advocates; students who have a deep understanding of how they learn can help their teachers with how best to challenge and guide them. We recognize that all students learn differently and we will collaborate with you, your parents, your teachers, and Athenian's Organizational Specialist to ensure every student's' fair opportunity for success. Students and parents can contact Jeannine Morales, Director of Learning Services, or visit her office upstairs in the Main Hall. 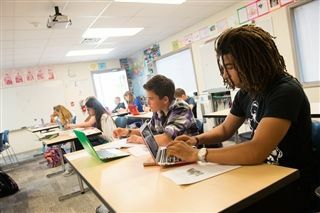 The Middle School Library is as much a community center as a place to do research. 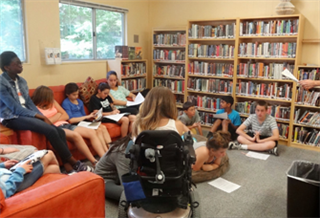 The Middle School librarian hosts grade-level book clubs, contests and competitions, study halls, and research workshops. Our librarians can help you navigate databases, the library catalog, and online searches.